One of the vehicles involved in the incident. 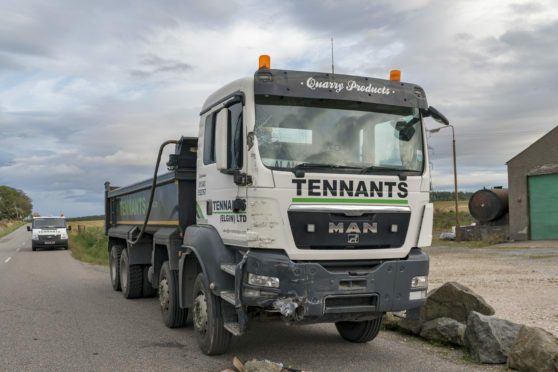 A school bus carrying children from a Moray primary school was involved in a collision with an HGV yesterday afternoon. Pupils from Rothiemay Primary School near Keith were travelling in the vehicle on the B9117 road near Grange when the incident happened at about 3.30pm. There was thought to be seven children on board the bus at the time of the crash. None of the children were seriously injured, although a few of the pupils suffered minor cuts to the face from broken glass. After the incident, the pupils were taken to a nearby house while their parents were contacted. The school headteacher attended the scene to help make arrangements for the children to get home. An ambulance was requested and the bus driver was taken to Aberdeen Royal Infirmary as a precautionary measure after suffering slight injuries to his face. The lorry driver was not thought to have been injured. A police spokesman said: “A call came into us at around 3.30pm about a road traffic collision between a school bus and a lorry and an ambulance was requested. “There were seven kids on the bus who are all safe. The driver of the bus has slight injuries to the face and one of the children has minor cuts to their face. Councillor Sonya Warren, chairwoman of the children and young people’s committee at Moray Council, spoke of her relief that no one was seriously injured. She said: “I’m very relieved that there no serious injuries and I am very concerned that it happened in the first place. Hopefully no one suffers any long-lasting side effects like shock or trauma. The children were travelling home from school on a bus operated by Deveron Coaches.